At last - heat exchangers designed specifically for cooling electronic enclosures that can be used for both indoor and outdoor applications right out of the box! No more bulky unattractive weather hoods...No more worries over what options to specify for outdoor applications. All models meet NEMA 12 and NEMA 3R requirements (UL50). Standard features include heavy duty galvanized steel construction with baked-on powder paint and epoxy-coated heat exchanger element. Air-to-Air Heat Exchangers are the ideal choice for applications that can tolerate operating temperatures somewhat higher than ambient. The KXRP Series utilize a high-efficiency convoluted aluminum heat transfer element. These elements provide excellent thermal transfer performance and are easily removed for cleaning. KOOLTRONIC manufactures its own heat exchanger elements. All KOOLTRONIC Heat Exchangers provide a large heat transfer area in a compact package with high performance air systems for high flow rates and thorough air distribution within the electronics or electrical enclosure. 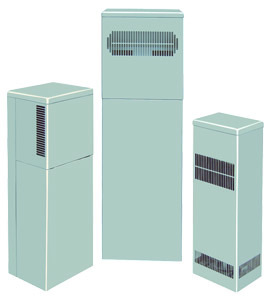 KOOLTRONIC also designs and manufactures a variety of heat exchangers to meet unique specifications. We invite your inquiries about our modification and custom-design capabilities. All Advantage KXRP models are UL/CUL Listed. Fabricated to the same standards as the uncoated convoluted aluminum elements, these are made from epoxy-coated aluminum stock that exceeds 1000 hour salt spray testing requirements.